After riding all night, this is not the kind of gastronomical treat one expects upon settling down for dinner at 5 AM. Yes, 5 AM. The only meal I had before this was breakfast. If anyone talks to me about (religious) fasting now, I'm gonna go religious on his friggin' numbskull with my Craftsman 1/2" Flex Ratchet aka Breaker bar of Gawd and grant him religious visions which rival Joseph Smith, Jr.'s. Oh, I'm sorry! Yes, back to the gastronomical treat. 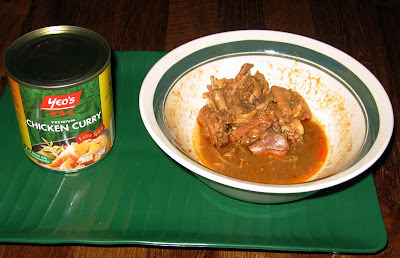 I think it's terribly sneaky to fill 1/2 a can with chicken bones; 1/4 with chicken skin; 1/8 with a quarter potato; fill whatever remaining space there is with bits of unidentifiable flesh and gravy; and call it a can of "Premium Chicken Curry." You just can't pressure-cook a pile of bones and honestly expect to pass them off as meat. This stuff looks like roadkill scraped off the road and tastes worse. Not even stray dogs in SAF camps will go near this. Perhaps someone at Yeo's marketing department slipped up and marketed animal-repellant as food? I never thought this was possible, but this crap actually makes the overpriced pig-swill at Rail Mall seem palatable. PETA-folks (Please Eat Tasty Animals), don't gloat. Fruits and vegetables have their own surprises too. Oww, I don't feel so bad now.